ISBN 0-947816-51-8, 154pp. Price 20 UKP. Available Oxbow Books, Park End Place, Oxford OX1 1HN, UK. It might seem rather old-fashioned that, at the start of the new millennium, a book on archaeological computing should be published solely in traditional hard copy format. However, whilst the black-and-white screen shots would no doubt have been improved by colour representation, this book generally succeeds as a paper volume. That it does so is due, at least in part, to the fact that the emphasis is not so much on the technology and how to do it, but rather on how the technology affects the discipline, justifying Internet Archaeology to vary its normal policy of only reviewing electronic publications. 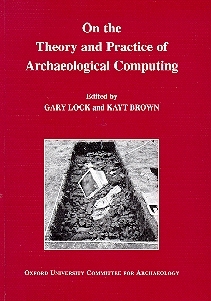 The book began as a conference session on the impact of computers on archaeological theory and practice, held at the 4th World Archaeological Congress in Cape Town in January 1999. It comprises nine papers, plus a short introduction by the editors, in which they note that their volume needs to be seen in the tradition of Cooper and Richards (1985) and Reilly and Rahtz (1992), rather than the more methodological and positivist approach adopted by many of the papers published in the annual proceedings of the Computer Applications in Archaeology (CAA) Conference. That some eight years have passed since the last survey indicates how timely this latest analysis is. The first paper, by Jeremy Huggett, sets the scene for the whole volume. The author notes that the application, and benefits, of computers tend to be taken for granted, with little discussion of their implications. As archaeologists, Huggett argues, we should be particularly aware of the impact of technological change on society, yet when it comes to the IT revolution, we ignore it. As an example, he notes that access to more data is widely perceived to be a benefit although there has been inadequate discussion of how we are to handle it. Whilst the post-processual emphasis on multi-vocality may be the only way we are to make sense of the data, currently the technology does not provide the complete freedom asked for by Hodder (1999a and 1999b). It is only by taking control of technology, Huggett argues, that we can make it our servant. This theme is taken up in the second contribution, by Jayne Gidlow. Gidlow reminds us that David Clarke argued that it was the fusion of theoretical perspectives with technological analyses that was vital for the disciplinary loss of innocence (Clarke 1973). Yet today they are discussed separately. Computers, in particular, are linked to a positivist paradigm in which they are used to search for pattern. Gidlow argues that this needn't be the case. The next six papers look at the impact of IT upon different areas of archaeological endeavour. It has to be admitted that not all are equally successful in focussing on the declared aims of examining the impact of computers on theory and practice, and occasionally there is the feel of practitioners lapsing into 'how to do it' mode. Hannah Forsyth is on safe ground in highlighting the mathematical computer-based approach which has dominated archaeological taxonomy. However, it is less clear how her text-based approach might be applied. It is one thing to accept that material culture can be seen as a language, but it may be more difficult to find ways of understanding it that don't mirror formal linguistic analysis. Glyn Goodrick and Mark Gillings look at the use of Virtual Reality (VR) in Archaeology. Again they are right to highlight this as an under-theorised area, in which the emphasis has been on how to achieve greater 'realism', without questioning how we can know what it is. The technology is not theoretically neutral and, like any form of reconstruction, it is not 'reality'. It has been suggested that the term 'synthetic environment' would be more accurate (Pringle and Moulding 1997). Whilst not fully supporting a change in terminology Goodrick and Gillings say that at least we must be aware what the term 'virtual reality' means. Francis Grew examines the role of digital archives in providing unprecedented access to primary data. This is one of the few papers to deal with the effects of the Internet on archaeology, and Grew draws upon his experience at the Museum of London and emphasises the importance of adequate metadata as a means of resource discovery. Anthony Beck describes the excavation recording system developed for Framework Archaeology (a consortium of the Trust for Wessex Archaeology and the Oxford Archaeological Unit working at Perry Oaks, aka the Heathrow Airport extension). The system is clearly Hodderesque in so far as it emphasises the importance of 'ground-up' interpretation by those working on site, 'allowing multiple organic narratives to evolve during excavation'. Beck advocates the Web-CD approach adopted by Powlesland et al. (1998) for dissemination. Ben Robinson provides a chapter looking at the development of Sites and Monuments Records which will be a lasting contribution to the history of record systems. Although specific to England, it demonstrates the importance of politics and history to an understanding of the current configuration but does not make explicit links to developments in archaeological theory. The chapter by Rog Palmer, on the contribution of computers to aerial photo mapping and interpretation, will also stand as a valuable descriptive history. Palmer also takes up the theme of the importance of digital access to data, particularly the potential to integrate air photo index data with other categories of archaeological information. Finally, André Tschan and Patrick Daly step back from specific application areas and ask if there is any such thing as 'Computer Archaeology?' This is a provocative but rather curious contribution, which also stands out for the frustrating abuse of footnotes to make additional or tangential points. Tschan and Daly present the results of a survey of American Archaeology and Anthropology departmental web sites aimed at identifying the status of a sub-discipline of computer archaeology. They conclude from the lack of reference to IT courses or research that such a sub-discipline does not currently exist and that there is no formalised structure. Whilst the data collection strategy may be unsound the conclusion is probably valid. They argue, however, that there should be such a structure with 'industry-wide departmental status' which would lead to the strategic and formal incorporation of IT into archaeology. I am afraid that I find the creation of a breed of super 'computer archaeologists' to be a rather disturbing spectre, and one which might well have the opposite effect to that desired by Tschan and Daly. As all the contributors to this volume have demonstrated, the adoption of IT is more than just a tool, such as the trowel or the wheelbarrow, as it has an impact on the intellectual framework of the discipline. However, it is still a means to an end, and not a goal in itself. Hence I am not as worried as Tschan and Daly that their survey reveals that apparently only 0.6% of American PhDs in anthropology and archaeology departments involve active IT research. Ideally all PhDs make significant contributions to archaeological knowledge, and some do it by applying new technology, but I would still look to computer scientists to develop the technology. Tschan and Daly lament the fact that this low level of expertise indicates that there can be very few academics capable of developing computer archaeology. There is certainly a role for vocational training courses which provide some archaeologists with specific IT skills so that they can occupy the small number of jobs that demand a high level of expertise. Rather than creating a sub-discipline, however, I would argue that all archaeologists should be aware of the potentials and limitations of computer applications, just as they should know about environmental archaeology. Indeed it is important that all archaeologists are familiar with the issues raised in this book and that they know that VR models and GIS are not theoretically neutral. However, they do not all need to be able to create a VR model or a GIS themselves, just as they do not need to be able to identify pollen or animal bones. Computer archaeology is special; the role of IT is so pervasive that it is integral to all archaeological activity. Computer archaeology is too important to be marginalised to a computer archaeology elite. Therefore this is a book that should be on all course reading lists. It is a valuable addition to the literature on the effects of the ICT revolution on archaeology. Given the speed of technological change since the last comparable survey (Reilly and Rahtz 1992) it is particularly welcome. All the more surprising therefore that it lacks contributions on the two major growth areas: the application of GIS, and of the Internet, especially given the theoretical ramifications of these two developments. Whilst it could reasonably be argued that GIS have been well covered by other recent publications (e.g. Lock and Stancic 1995; Lock 2000) there is a pressing need for an examination of how the Internet Revolution is affecting our subject. Nonetheless, this is still a useful volume, especially to be recommended to those with positivist tendencies who would adopt the technology but remain unaware of the baggage that comes with it. Clarke, D.L. 1973 'Archaeology the loss of innocence', Antiquity 47, 6-18.
Cooper, M. and Richards, J. (eds) 1985 Current Issues in Archaeological Computing. Oxford: British Archaeological Reports S271. Hodder, I. 1999a The archaeological process. Oxford: Blackwell. Lock, G. (ed.) 2000 Beyond the Map: Archaeology and Spatial Technologies. Amsterdam: IOS Press. Lock, G. and Stançiç, Z. 1995 Archaeology and Geographical Information Systems. London: Taylor and Francis. Pringle, M.J. and Moulding, M.R. 1997 'Applications for Virtual Reality, and associated Information Technology, in the illustration of archaeological material', Graphic Archaeology 1, 22-33. Reilly, P. and Rahtz, S. (eds) 1992 Archaeology and the Information Age: a global perspective. London: Routledge.